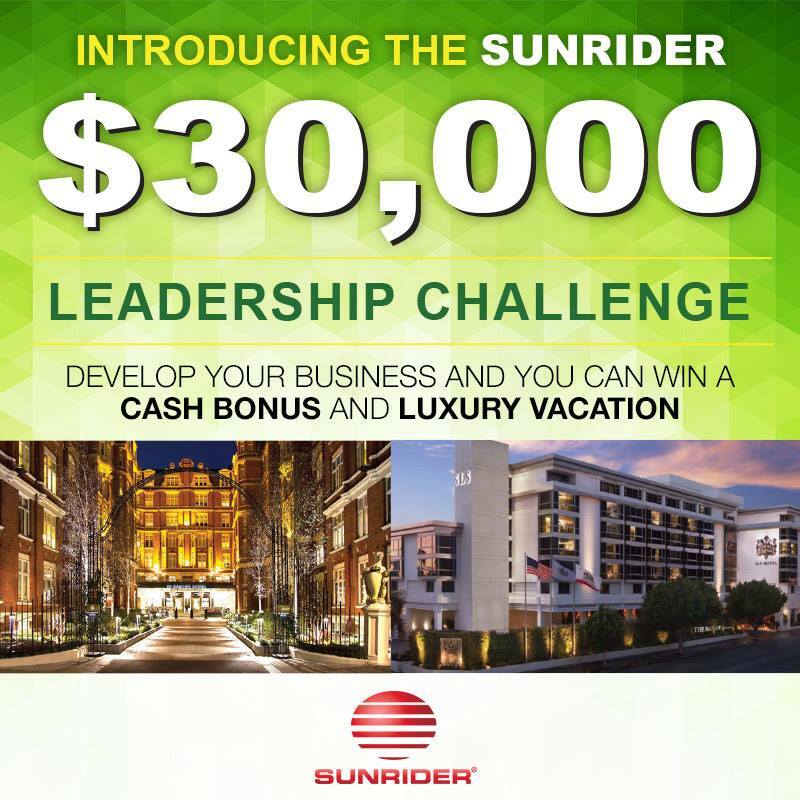 You are here : SunHealth AZ Business Opportunity $30,000 LEADERSHIP CHALLENGE!!! This is on TOP of the Residual income of around $16,000 a month! $30,000 LEADERSHIP CHALLENGE!!! This is on TOP of the Residual income of around $16,000 a month! Meet the requirements and win one of these AMAZING PRIZES. $30,000 LEADERSHIP CHALLENGE!!! This is just an amazing opportunity to break out and earn an extra $30,000 LEADERSHIP CHALLENGE!!! on TOP of the already lucrative Sunrider International payout program! It is too wonderful!! $30,000 LEADERSHIP CHALLENGE!!! Once you help 16 people in your organization do a turn over of $5,000 in sales (they will earn an average of $1,645 a month), you will earn the Leadership bonus of $25,000 and flights for two, and three nights at the 5 star hotel!!! This is on Top of residual income that one makes at that level (around $16,000 a month) !!! This is the dream bonus. Build your Sunrider Business, earn money every month as you are building your asset that will provide you with residual income. and get the $25,000 CASH and the first Class vacation you have always been dreaming of, but could not take the time or have the money to do it. Vacation: Take your partner and enjoy the trip, worry free! What a fun time you can both have. what an opportunity to travel, worry free and stay in a FIVE STAR HOTEL 🙂 This is a treat of a lifetime. Call me at 602-492-9214 or email me at : sunhealthaz@gmail.com for any and all questions. There is more info below the picture. $30,000 LEADERSHIP CHALLENGE!!! Qualify as a Executive Business Leader for three consecutive months and earn a $25,000 cash bonus plus a trip for two, valued up to $5,000*, with three nights at the luxurious SLS Hotel at Beverly Hills or St. Ermin’s Hotel in London, and special gourmet dinner. $20,000 PRIZE PACKAGE!!! INCLUDES $15,000 CASH AND A 3-NIGHT LUXURY VACATIONQualify as a Silver Master Business Leader or Golden Master Business Leader for three consecutive months and you will earn a $15,000 cash bonus and the same three-night, two person luxury vacation that is described above. $10,000 Bonus Earn a $10,000 bonus when you become a Group Business Leader or Golden Group Business Leader for three consecutive months.